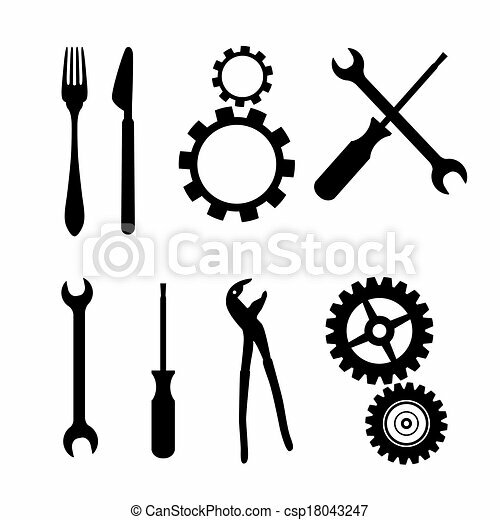 Black symbols isolated on white background - cogs, gears, screwdriver, pincers, spanner, hand wrench tools, knife, fork. Stop hand mosaic of service tools. Vector stop hand icon is shaped with cogs, screwdrivers and other technical items. Concept of technical job. Hand mosaic of repair tools. Vector hand icon is composed of gear wheels, wrenches and other machinery objects. Concept of maintenance workshop. Hand composition of repair tools. Vector hand icon is shaped of gearwheels, screwdrivers and other technical objects. Concept of tuning work. Burn hand collage of repair instruments. Vector burn hand icon is composed of gearwheels, spanners and other technical items. Concept of technician service. 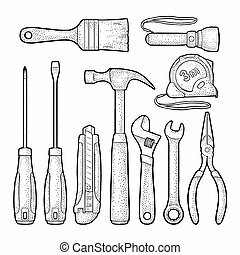 Hand tool vector construction handtools hammer pliers and screwdriver of toolbox illustration workshop set of carpenters spanner and hand-saw isolated on white background. 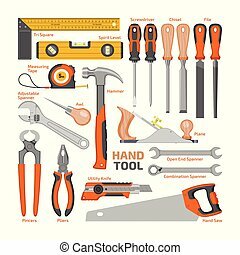 Hand tool vector construction handtools hammer pliers and screwdriver of toolbox illustration workshop set of carpenters spanner cutter and hand-saw isolated on white background. Mechanic gear service hand mosaic of workshop tools. Vector mechanic gear service hand icon is made of cogwheels, spanners and other service objects. Concept of maintenance work. 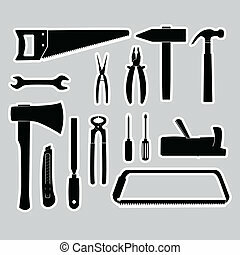 Hand tools black icon concept. Hand tools flat vector website sign, symbol, illustration. Set hardware tools. 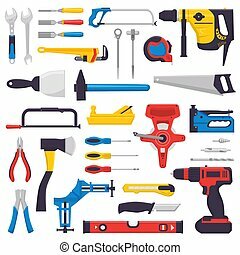 Hammer, screwdrivers, tape measure, adjustable wrench, pliers, utility knife, flashlight, brush. Vector black vintage engraving illustration. Hand draw in a graphic style. Isolated on white background. Side view.